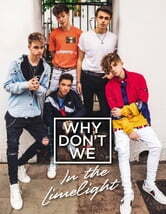 ***In the Limelight ***is the official Why Don’t We autobiography, full of never-before-seen photos and behind-the-scenes info about one of today’s hottest bands. reading the guys’ life stories can be emotional but funny at the same time!! if you’re a limelight you should really buy this book! !